It is no secret that games are now coming better than ever and increasing more demanding. To add to that, overclocking is becoming a more serious deal. 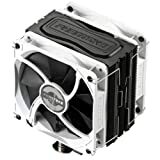 Essentially, you need the best CPU cooler possibly available because it is your CPU that takes the heat, and may lead to the damage of other components of the computer if not well taken care of. The importance of this is that with a well-maintained temperature, you will mostly have a flawless performance with reliability and stability almost guaranteed. To cut it short, the CPU is the main thing about any computer, and once anything goes wrong with it, everything goes wrong with your computer whether you are overclocking or not. At the end of our review, we found the Noctua NH-D15 to be the best CPU cooler for someone looking for an air cooler. It is not only smooth in its cooling performance but also silent and very effective. If you prefer a liquid CPU fan, we have found the Thermaltake WATER 3.0 to be the best in many ways. Apart from providing good cooling performance, it is also secure enough to prevent leakage and it has great overall performance. Lately, it has mostly been all about gaming for us. We have not only gotten ourselves revolving around games and gaming, we have also been checking various gaming components. In our reviews, we have looked at things like Best Wireless Mechanical Keyboards for Gaming, Best Gaming Chairs, and a Guide to Getting the Best Earbuds for Gaming. And we are not about to stop. What this means is that we have gathered more than just the knowledge of an average Joe. For this review, we have taken a very close look at over 40 of what many have considered the best of both air and liquid coolers. What we did as we do in all our reviews is to put together all we know, get the opinion of experts, and find out how the coolers have served real world gamers. We have taken a look at how the coolers have performed under intense and prolonged gaming conditions, evaluating their cooling performance, silence, convenience, and ease of installation among other factors. Although veteran gamers and professionals would hardly pick the air cooler over the liquid, it is usually the best for someone who is still trying to find his way around. It is not only easy to install, the air cooler has no problems such as leakage that you may get with the liquid cooler, therefore, it is generally safer. More so, it is less expensive and there are a selected few with very good performance though generally not as great as what the liquid cooler offers. Generally, when it comes to the performance of air coolers, the bigger the better. The problem, however, is that if it gets too big, it may not fit into your case. From the looks of the Noctua NH-D15, you can easily suspect it will give one helluva cool ride. Well, you are right! Before the D15, what was ranking was the D14. The NH-D15 came as an upgrade of the former, and it didn’t disappoint. While the difference between the two cannot get you from one part of the world to the other, it is significant enough to make the NH-D15 one of the very best computer fans available. The NH-D15 is built and optimized for minimal noise and temperature, and in fact, you could compare its performance to a liquid cooler. This is because of the high-quality and well-articulated components used in its making. It comes with 6 aluminum heat pipes which are well organized to allow for great cooling and less noise than most others in the very busy CPU fan market although, the noise control could have still been better. In addition to this, it has a twin radiator fitted with 140mm fans to ensure that there is constant and sufficient airflow. For which you may either decide on using one or the two based on your needs. Those who have used the NH-D14 would want to know how quiet it is, compared to the amazing performance of the NH-D15. It can only get better. In fact, one of the main things that Noctua emphasized in this upgrade of D14 is the silence of the D15. Measuring 165 x 150 x 161mm and weighing 3lbs, this is neither the smallest nor lightest of computer fans. Instead, you would need to be sure that it would fit into your case before buying this. Finally, you get to have up to 6 years limited warranty with this piece and it supports both Intel and AMD sockets. If you have a PC that is mostly in one place and you wouldn’t need to keep moving it around, this beast should be in your cage. The price may actually get you chewing your fingernails, but the cooling it promises will definitely be worth it in the end. 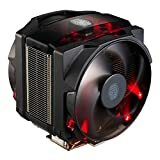 Cooler Master has produced some of the very best computer fans there are at the moment if you want to make a very long list and you will find the MasterAir Maker 8 among the big boys. Apart from the fact time was taken in the making of this CPU fan which is obvious in the design and how detailed it is, there is the good performance that you get with it. About the design, Cooler Master gives you an option of having 8’s LED lights cooler which only enhances the beauty of your rig and excites your gaming mode. This cooler makes use of a technology called the 3D Vapor Chamber which is an evolution in vapor chamber technology. What this does is to transfer heat even at its vapor stage through the fin and ensure that you get what may just pass for the best cooling experience. It features a double-140mm fan which can get up to 1,800 RPM. There is as well an extra fan bracket which supports 120mm fans. The good thing with the fan brackets is that switching them is as easy as it can get because it is made in such a way that you do not need any hard work to get it off. Another thing is that it comes with 8 heat pipes which are connected to complement the chamber and offer a better heat transfer. When you consider its looks, it will seem as though it would require a degree in engineering to fix, but just follow the simple instructions, you will see it’s all a stone throw. Comes with an extra fan bracket. If what you want is a complete piece of beauty, technology, and performance, this is it. Also, for someone with customization in mind, this is a right hit. Just as it gives you almost everything complete, nevertheless, it requires more money than most others. This may as well be your dark knight if you are all about silent performance. While we place the NH-D15 above this in cooling performance, this is unbeatable when it comes to silence. With a 135mm fan, the Pro 3 is CPU cooler is considerably large in size, even though it is not as massive as some others. It also has another 120mm fan which sits in front of the other. Easily, this ebony could pass for your best CPU cooler if you have your eyes set on silence and performance. Thanks to its well-designed airflow-optimized fan-blade. For cooling activity, the Dark Pro 3 has 9 aluminum fins and 13 heat pipes that take off all the heat even when you are heavily overclocking. Another thing to consider with this is that you hardly get the best in air CPU coolers when they are not large and heavy. This somehow keeps to the rule by coming as a piece that is both massive and weighty. Standing at 163mm tall, it comes with a backplate to help in the installation, as normally it should go above most motherboards. While it could be a little hard for some people to install, the main problem we had with this is the amount of space it takes. The fan makes it very hard to use your first PCIe slot as it covers it. With this, you get a 3-year warranty, which is considered generous. If beauty is your thing, this is beautiful. Not the easiest to mount. If you are like some of us who think silence is really golden even for cooling fans, this may be it for you, and after all, it is from a company called Be Quiet! More than just the silence, this has a lot to brag about as regards keeping your CPU at the right temperature. The NH-U series of coolers have been for Noctua, the pillar of success. With the original NH-U12 and NH-U9 which first came to the market, it was good, but the NH-U14S has the changing story. What the Noctua NH-U14S has above most others in the market is an outstanding performance. That, of course, is in addition to its simple yet classy design and generous features. Little surprise that it was introduced in 2005 and now over 10 years later, it is still a fan to reckon with. Coming with a single tower, this is still bigger than some of its peers in the market. Nevertheless, it will fit into many cases easily. The cooler has the single NF-F15 140mm premium PMW fan which doesn’t only work well, but also quietly. If you need more than a single fan, this allows for the addition of another, even though you would need to get that separately. The fan which measures 140 mm x 150 mm x 25 mm in dimension, has a speed of 300 – 1200 RPM when set on low noise, while it goes up to 1,500 RPM on maximum. Even as you get that, the fan noise still doesn’t exceed 24.6 dBA at max. Considerably thin, the cooler has 6 heat pipes that are copper made and nickel plated. The heat pipes do well in taking off heat and transferring to the fins. Although with a good thermal transfer, most of the cooler is aluminum made, which is in fact, one of the reasons why it is less heavy than many others. It supports both Intel and AMD sockets and has a six-year warranty. If what you are looking for is outstanding performance, this will do just fine. While we didn’t find it to be the most powerful out there, it is still powerful enough to run well for most users. The Cryorig R1 Ultimate came to rival the Cryorig R1 Universal which is obviously behind in both features and performance. While they very much look alike and may even confuse most people, the universal works for most PCs while the Ultimate is all out to perform. Mostly compared side by side with the Cooler Master MasterAir Maker 8, this has a very good build quality and design. A dual tower cooler, the R1 ultimate features two XF140 high precision 140mm PWM fans which have considerable noise control. While the first side of the tower is designed with 42 fins, the other has 53 fins. This doesn’t only increase speed, it also adds pressure to air so that heated air can make its way out quicker. The fan featured has a speed of 1300 RPM max. Even when you get two fans with this piece, you can easily upgrade to three if you still wish. The cooler has seven heat pipes which function greatly in taking away heat from your CPU. These pipes are designed and placed in an optimized manner to ensure even heat distribution which also helps in keeping the CPU generally cool. It is compatible with both Intel and AMD motherboards, and it comes with brackets for both. There is a brilliance to the technology used in the build. It is not the most quiet. Has a bit of weight. There are very few air coolers that can give liquid coolers a run for their coolness, and the Cryorig R1 Ultimate is one. Essentially, if you are into overclocking or need something that can perform close to liquid coolers, you can as well start checking from this. Phanteks is a pretty new company that happens to produce coolers that perform great.. The PH-TC12DX_BK is arguably the best CPU fan to make it out of the company if your eye is on coolers below 50 Dollars. It is designed with PH-F120HP PWM Premium Fans which run at up to 1800 RPM in speed with noise level below 27.6 dbA even at maximum setting. You can get this even much lower when you take the speed down using the 4-pin PWM connector of the fan. Also, it has a single tower radiator which features four 6mm U-shaped heat pipes. Because of the arrangement of the heat pipes which are nickel-plated copper, it distributes thermal energy really well. More so, the heatsink has aluminum fins which improve heat dissipation. More so, it features the Patented. P.A.T.S (Physical Antioxidant Thermal Shield). With that, cooling performance is significantly improved as thermal radiation is better controlled. While it performs generally great even under heavy load, it drags it’s feet when it gets to overclocking, as such it may not be the best if you want a CPU fan for overclocking. It is compatible with both AMD and Intel sockets. More so, you get up to five years of warranty. It is not the best for overclocking. The first thing to understand is that this is not your guardian angel if overclocking is your aim. Nevertheless, for an enthusiastic gamer who is looking for an air cooler that is relatively cheap, this is not a bad bargain at all. It gives you great performance, secure installation, and friendliness of use. Noctua’s DX coolers are quite good, but they are not bold enough to push their way through when you are looking for the very best CPU fans. 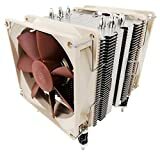 That being said, it is very different with the Noctua i4, it stands atop if you are looking for a stable and good performing cooler for your Intel Xeon CPU. The i4 features 2 Noctua NF-B9 premium fans which are designed with PWM. What this means is that you get automatic speed control. The speed of the fan at low noise is 1300 RPM, while at maximum you get 1600RPM. Another thing with the fans is that they feature Noctua’s Self-stabilising oil-pressure (SSO) bearing which plays an important role in giving it an optimized aerodynamic technology for great and quiet cooling. To ensure you get the best of heat transfer, it comes with 4 heat pipes. There are aluminum cooling fins as well, which are good at absorbing and disseminating heat. Even as it is easy to install, it comes with the company’s SecuFirm2 mounting systems which apart from enhancing the ease of mounting, also ensures you get secure and high-performance installation. With 6 years warranty, the Noctua i4 is only compatible with Intel LGA-2011, LGA-1356 and LGA-13566 sockets. You will not sweat to install it. Because of its compatibility, we think it is a little pricey. While very quiet, this performs well. In fact, it has claimed its place as a fan made by Noctua. We are recommending this for someone running on Intel Xeon CPU. 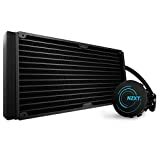 Considering factors such as its ease of installation, performance, and silent solution, this is a good go-to for your cooling system most especially if you are an enthusiastic gamer. Your collection of the best air computer cooling fans is hardly ever complete without the PH-TC14PE. The manufacturing company is relatively new, having joined the market in 2007 but the irony is that the PH-TC14PE was actually the horse upon whose back the company rose to fame. The cooler comes with 2 Phanteks PH-F140 140 fans, and even though it allows you to mount up to three fans. For the third, you would need to order separately. The 140mm fans have a speed of 1200 RPM. At that speed, you get airflow of 78.1 CFM. It comes with a dual tower radiator which is large enough not to fit into small cases as it measures 160mm in height and 140mm width. Also, it is 134mm long. The radiators come with aluminum fins which we found very effective in heat control. More so, the base and heat pipes are made of copper which has proven to be very good at transferring heat to avoid overheating. With the way it is designed and the way it functions, once it is able to fit into your case, you are good to go. The cooler didn’t come cheap in price, neither does it come cheap in performance or even looks. Hence it is one piece that combines performance and beauty in one place. Finally, it is compatible with both Intel and AMD sockets and it has a warranty of five years. The noise level is very low. It comes with different color options. Not the easiest to install. While generally good, this should be able to serve you even if you have overclocking needs. Nevertheless, the best overclocking performance would be achieved with Noctua-D15. The most important thing with this is the value it gives to its all round great performance. Naturally, the liquid coolers provide much better cooling than air coolers. In fact, for someone with much overclocking to do, we would recommend the liquid coolers since they are better when it comes to cooling off the CPU. The thing, however, is that they are not as easy to maintain as it is with the air which all you have to do is ensure you clean off the dust once in a while. With these, you would need to always monitor to ensure there is no leakage otherwise, you risk damaging your CPU. Here are those we consider to be the best liquid CPU coolers. Thermaltake has a very faithful following which it has developed over the years thanks to its adventurous mind and the readiness to make their fans even better. Those things are the signature of the water 3.0. This All-in-one liquid fan cooler is one of the best you can get if your mind is on the best AIO. We don’t know the first thing that would drag you to this, between its beauty and the quality. What will keep you like always, however, is its performance. The radiator has a 360mm surface and can take up to 6 120mm fans which should be more than enough for any crazily overclocked CPU. The fans also feature 12 RGB LED which stands it out from most others aesthetically. With the massive performance you get, this is not one that will give you absolute silence. At the best performance, 800-1500 RPM, the noise is more pronounced, but when you get it to silent mode, it spins at 400-1000 RPMs. Even when the noise goes down, the noise level generally is between 18.5 and 26.4 dB-A. It comes with a five-year warranty and it is compatible with both AMD and Intel sockets. It comes with single, double, and triple rings based on your case and needs. Powerful enough for crazy activities. The possibility of leakage is almost zero. The Thermaltake WATER 3.0 is the best liquid CPU cooler you can get if what you are looking for is an AIO liquid cooler that has very strong performance. For heavy overclocking, there is hardly any other CPU fan that can beat out this piece. More so, it has quality and beauty to it. This is your piece if you are a heavy gamer. 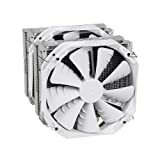 If you have been very close to computer fans, there is one thing you must have noticed, and that is that large and heavy coolers tend to perform better. That is where the NZXT Kraken X61 comes in with a difference. This all-in-one cooler stood out from the crowd when it first came thanks to the intelligent technologies infused in it. This is most especially as it features an Integrated Variable Speed Pump which ensures that even when you get crazy performance as regards pump power, you do not lose its quiet performance. It has a 280 mm radiator which still ends up to be rather light and not taking too much space. This comes with tubes that although have nothing special to them seem as though they could survive forever without any problem of leakage. Also, because they are long, the tubes make it easy to fix and compatible at various positions. Another thing with this closed-loop liquid cooler is that it has two 140mm fans which measure 140 x 140 x 25mm in dimension. The fan speed is given as 800~2000 RPM ± 10%. It may not be the Bolt among others, but as a result of the entire makeup, you get an amazing cooling solution. More so, the CAM software that comes with this is one thing that can change your entire fan control experience. With the software, you can easily control your fan, read the temperature, and set your LED lighting among other things. Coming with a 6-year warranty, this does not require any maintenance apart from the regular dusting that you need once in a while to get it all clean. It is not heavy on the motherboard. Very useful CAM software for control and monitoring. If you are worried when it comes to the weight of your CPU coolers and you need something that is light, portable, and would not be heavy for your motherboard, you could bet on this. It combines good makeup, cooling performance, and low noise even when overclocking. The Corsair Hydro Series H110i may just be the best CPU cooler you will lay your hands on. That is mostly if you are interested in a liquid cooler that takes to heart delivering a really cool performance. This prefilled all-in-one liquid cooler has been one of the favorites among enthusiasts including us. It is very good at heat control thanks to its 2 SP140L PWM fan which does not have the regular design. More so, it features copper cooling block as well as flexible rubber hose that make it easy for installation and do not allow for evaporation. With these, it is simply performance on one hand, and convenience on another. Even as most cases can only accommodate 240mm radiators on 15 MM spacing, this comes needing 20 mm spacing for the 280mm radiator. That is one very important thing you should check before ordering for this fan. This cooler features the Built-in Corsair Link which is at the center of your customization of LED light, as well as speed and temperature monitoring and control. It is compatible with AMD and Intel sockets and it comes with a five-year warranty. Not the hardest when it comes to installation. Has thick tubes that promise durability. Ease to customize and monitor. It is large and may not fit into all cases. Even as the noise is controlled, it can get loud for some, as the emphasis is strongly on performance rather than silence. If what you want is one that comes with extras such as integrated fan controller and LEDs, this may not be for you however, this CPU cooler ensures good cooling performance. Arctic has neither been too old nor has it been too young in the business, but it has been good in many ways. The company’s Liquid Freezer 120 is one CPU cooler that comes with a very strong 120 mm radiator and tops many others when it comes to providing the best of cooling performance. Featuring a 49 mm deep radiator, this is neither the smallest nor the largest in size, but beyond that, it functions efficiently, even as it comes with a water pump that we found really powerful. Designed with dual 120mm fans, it is easy to have the speed controlled or adjusted thanks to its PMW function. The fans featured are placed on either side to provide the most excellent cooling solution. At the maximum speed of 1350 rpm and producing a sound that doesn’t exceed 22.5 dB-A, the freezer 120 is stable enough for a very decent cooling activity. With a pull and push fan, it is very surprising that this comes as quiet as it is. In fact, you can hardly find a 120mm that beats this in silence and surprisingly, even in performance. It even gets better when you put its price into consideration. It comes with a 6-year warranty and it is compatible with AMD and Intel sockets. This comes with the 240mm model which has a 240mm radiator. That is likewise good, but is not as compact as this, hence it would fit into fewer cases than this 120mm version. One of the best cooling performances. Can fit into most cases as it is morally compact and flexible. The radiator may still be big for some cases. While this is a great piece we would recommend it more to mid range gamers who are looking for a great liquid cooler. While it doesn’t come with many features, it comes with very decent performance, considerable silence, and friendliness as regards installation. This is a compact All-in-one liquid cooler that is out to bring water cooling even closer home than it has always been with mainstream gamers. It comes with a 120mm PMW fan which has a double blade and has been designed with anti-shock pad. With that, you get greater air pressure at one side of the road for easy and quicker heat air expulsion, and low noise at the other. The radiator is made of aluminum and functions effectively thanks to the high -performance fan. Up to 1800RPM is what the single 120mm hydro-bearing fan can offer to you in speed. We didn’t find the radiator to be the easiest to install, even though once properly installed, it is secure. It comes with other features that improve its general performance such as the water block that has high-density micro-channel design for proper circulation so as to get the heat off easily. More so, it comes with a water block that is considerably large and designed for efficient heat transfer. That is due to its design to have the coolant and the cold plate together so as to have better heat transfer. Smaller cases have a big problem getting good CPU fans that would fit them, most especially liquid coolers. The Deepcool Captain 120 EX should be able to help that out as it is considerably smaller than most others. It is compatible with both Intel and AMD sockets. There is quality to its build that assures durability. Not the easiest to install but instructions are detailed enough. 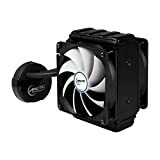 For someone looking to build a compact rig and is in need of a compact liquid cooling solution, the Deepcool Capptain120 EX may just cap the search. The cooler has a great performance and mostly answers the right questions if you are looking at ease of installation, pricing, durability, and looks. The Corsair Hydro Series H has been very popular among those searching for a liquid cooling solution. From the H40, H50, and H60, followed by the 65 which was popular as a result of its silence and many others that came to follow, Corsair has only been getting better. With the H100i V2, which was drawn from the H100i, we have found an all-in-one liquid CPU cooler that brags of performance for extreme gaming and intelligent technology. While the H100i is still a good option, and more expensive, we prefer this as it combines performance with low noise. It comes with dual 120mm fans that hit a 2435 RPM in speed. In measurement, the fans measure 120mm x 25mm. While at 2435 RPM the speed is below what the 2700 RPM you get with the original H100i, this gives better pressure. The radiator which is 30mm thick features 2 thick tubes which have a promise of durability and eliminate any slight possibility of any leakage. Also, there is a built-in Corsair Link which serves to assist you when it comes to customization as well as monitoring the temperature. With this, you can easily get to set the cooling performance as you wish, as well as set the LED lighting easily. The cooler is compatible with both Intel and AMD sockets, and there is a 5-year warranty that accompanies it. It has the great ability to endure much bullish gaming. Because of the thick tube it has, it can be inconvenient when fixing, even though there is a promise of durability. Not in the budget line of things. This is a premium priced cooler, just as it is a premium performing one. We would recommend this for extreme gamers who are very serious with overclocking. Another one from Corsair, the Hydro Series H60 is a liquid cooler which has been designed in such a way that installation would be easy, because it is intended to fit in smaller cases. It comes with a 120mm SP120L fan that stresses on silence while offering good cooling performance. The fan has a speed of 2,000 RPM. The possibility of leakage has been taken to the barest minimum with this cooler by the use of flexible tubes that have been improved from the earlier versions and that have been designed to give improved flow. We found that its heat distribution and cooling are enhanced by the use of the copper cold plate which unlike the round type featured in many others, is more squared. Another good thing with this is the installation. Unlike many others that would require screws to install, this comes with a magnetic bracket that is very simple to get fitted in whether it is for AMD or Intel processors. It is compatible with both AMD and Intel motherboards and it comes with a warranty of five years. Compact and with nice looks. It comes with a promise of long lifespan. Its smaller fan may not the best for heavy gamers. We can as well say the Corsair Hydro Series H60 is the best CPU cooler for someone who is not a very heavy gamer. Nevertheless, if you need something that would endure some very brutal gaming and bullying, as well as strong overclocking, this may not fit rightly. Overall, however, it is a cooler that is very effective in performance. There is nothing that beats the best gaming experience with the mind at rest that you are covered on all sides. That is what having a great computer fan can help you achieve. Your gaming can never be complete when the Processor, which is at the core of your computer’s performance, is having a problem as a result of heating. This doesn’t only make your immediate gaming to start freezing, but, it may lead to an irreparable damage to important components of your computer. We would recommend that if you are overclocking, the liquid coolers would be better, even though there are some air coolers as well on the list that perform likewise good but in general, any of the CPU coolers from this list will ensure great cooling performance. Can You Play Game With An NVIDIA Quadro GPU, Is It Any Good?